Network Infrastructure - A fully functional mobile point-of-sale application relies on a strong wireless network foundation. For some organizations, this foundation might not yet be strong enough to support live transaction processing from every single patient room. PCI Concerns - If there's a hotter topic than Meds-to-Beds, it's definitely PCI Compliance. Although Validated P2PE Processing can be accomplished with the EvolutionPOSV2 Solution, the concern of processing any credit card data over a wireless networks stops some IT departments from giving it the green light. Using credit card tokenization (a feature available with many of our credit card processing integrations), you can securely collect credit card data for charging transactions to a patient's credit card. You can also charge the delivery to an A/R account or mark that payment is still pending. Once you've prepped all of your transactions, they are loaded onto an Android tablet and you're good to go. 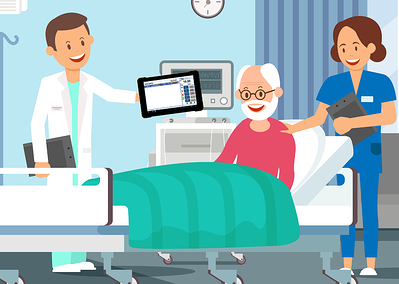 At the patient bedside, you'll capture signatures, collect cash payments if you choose to and mark deliveries as completed. It all happens offline so wireless infrastructure isn't a concern and no credit card data is processed by the device at any time. After completing all deliveries, it's back to the pharmacy. The tablet is connected back up to the pharmacy wireless network again and signatures are synced with your point-of-sale. They'll appear just like any other transaction processed in the pharmacy. Regardless of how your Meds-to-Beds program is structured, point-of-sale solutions can help to make your programs a success. On a separate note, we are proud here at RMS to announce that our blog has won an award! The folks over at Feedspot.com awarded us with having one of the Top 30 POS Blogs, out of 100's of blogs they reviewed! Thank you to all our readership who helped us get this award!